Legendary journalist Dan Rather sounds off to Larry King on the Orlando massacre and the impact the shootings will have on gun control and the NRA.Will Congress put forward legislation regarding assault rifles and background checks? "First of all, your heart goes out to the families who lost people, either killed or maimed. Clearly, it's important I think, Larry, for us to keep in mind as Americans that an attack such as this is an attack on all of us. That's the way I view it. There's been a hole in my heart and I'd be surprised if nearly every American didn't feel the same way. But unfortunately, we can expect more of this, not less, as time goes along." — Dan Rather on the Orlando tragedy. "The late Ed Murrow, one of my journalistic heroes, had a great word during World War II. His favorite word was 'steady.' Steady. I do think it's time for us to be steady, calm, but also asking ourselves, 'Well, where do we go from here? What needs to be done? What extra steps do we take? What do we learn from this?' It's an important time for our country." – Dan Rather on the Orlando tragedy. "I've known Donald Trump a long time, and at one time we got along pretty well. I eventually did a story that he didn't like and that pretty much split it. I respect Donald Trump in many ways. He's done a wonderful job with his family. I think one of the ways you judge a man's character and his being is to look at his family." – Dan Rather on whether or not he was shocked by Trump's attacks on the press. "What prompted me to do that was when he began to ridicule individual press people for things such as one person who was trying to question him was physically challenged, and to ridicule that person, and to attack individual press members on a personal level. And also to talk about how when he becomes president - if he becomes president - how he, Donald Trump, would punish such institutions as the Washington Post for how they covered him. This is not the American way. This is outrageous. Now, I've dedicated my life to trying to be an honest broker of information. Play no favorites, pull no punches. But when he attacks the press, and particularly those personal attacks on the press, I thought it was time to speak up." – Dan Rather on his criticism of Donald Trump's attacks on the press. "Larry, you and I have spent a enough time around politics that we know that overnight is a long time in politics. A week is forever. And we're talking about a convention that doesn't happen until July and an election that doesn't happen until November. Could any of these things that you just said happen? Yes, they could happen." 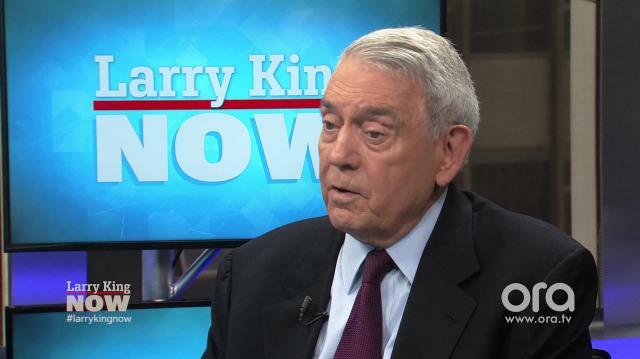 – Dan Rather on the Democratic convention and the election timeline. "As a reporter, you always keep your antenna out for some of these other possibilities because what we least expect often occurs." – Dan Rather on the election. "I think I've learned a few things in a lifetime of reporting. I've been reporting for pretty close to seventy years now, if you can believe that. And there are certain things I've learned. Some of them I didn't realize I'd learned until recently. For example, how deeply one needs to be into gratitude, humility, and modesty. Let's face it, being on television, particularly when you're younger, doesn't lead you to think about things like gratitude, humility, and modesty. But as I get older and reflect on what I've learned, one of the things I've learned is the deep and abiding value of those three things." – Dan Rather on what he's learned as a journalist. "You and I agree, and I think most Americans agree that independent - fiercely independent when necessary - journalism is the red beating heart of freedom and democracy. Now in the new digital world, the very idea that well, journalists are no longer relevant, what does that do to the idea that you need journalism for the check-and-balance of power?" "It's every bit as important today as it's ever been. In some ways I think it may be more important today, and here's the reason. It's harder today to get at the truth. As I think Oscar Wilde said, 'Truth is rarely pure and never simple'. Another way of putting that: the truth is hard to get to." – Dan Rather on whether truth is still important in journalism. "This diminishes the coin of trust. When everything is breaking news, then nothing really is." – Dan Rather on the over saturation of the ‘breaking news’ label.